A charity Cheese and Wine Quiz organised by Napthens Solicitors has raised a staggering £2168 which will go towards Blackburn Youth Zone mentoring programme. Raz Mohammed, CEO Blackburn Youth Zone, said: “Blackburn Youth Zone focuses on equipping young people with essential life skills to become the best they can be and provides alternative educational programmes to enhance their career opportunities such as DofE, STEM courses, Junior Science Clubs, Abacus (Creative Maths), NCS, Young Ambassadors and Young Leaders programmes as well as sports leaders and climbing qualifications. “Blackburn Youth Zone goes the extra mile, giving young people a safe and inspiring place to go. Our work aims to strengthen cohesion, raise skills and aspirations and maximise health outcomes for all young people, enabling them to be our future leaders. 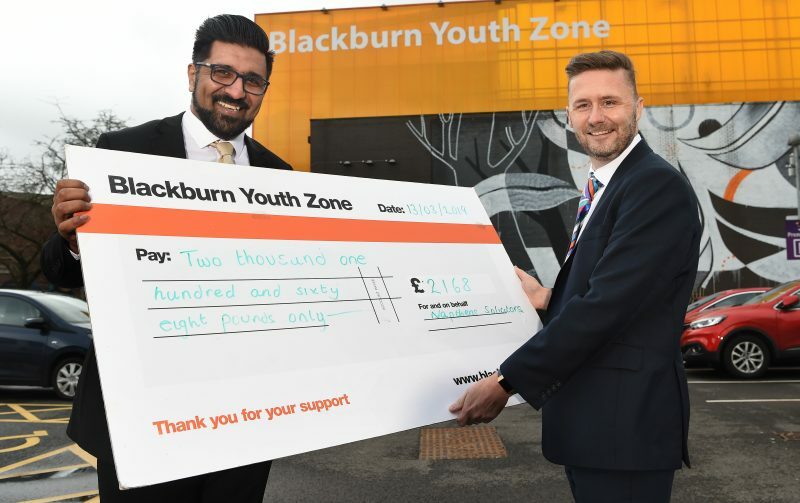 Napthens Employment Partner, Head of East Lancashire Office, Oliver McCann said: “We have been a supporter of Blackburn Youth Zone for many years and we are delighted this event, the first time we have done this, has raised much-needed funds for the charity. Free Mother’s Day Card with Every Mother’s Day Cake at PoundbakeryWhat’s On in Blackburn from Monday, 1st April 2019 to Sunday, 7th April 2019.